Buldooser Venemaal välismaise juustu kaste ründamas. Last Thursday, massive and demonstrative imported food destroying action was launched in Russia against stuff falling under countersanctions category. In times past, cargo suspicious for Russia was simply sent back from the border. 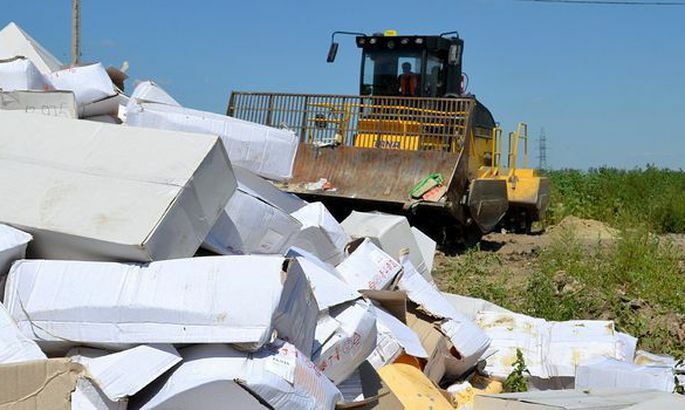 On June 29th this year, however, President Vladimir Putin signed a ukase prescribing that agricultural goods produced in banned lands will starting August 6th undergo confiscation and destruction. At that, throwing away foods fit for use is a controversial measure in a nation with history of repeated hunger. Even in Soviet Union, kids were taught to respect a piece of bread. To that backdrop, the pictures and clips of bulldozers crushing heaps of food into the earth come across as sacrilege. Even among the population, the action does not seem to resonate with people wondering why the confiscated foodstuff might not have been used in hospitals or children’s homes. In an Internet poll in Russia, responded to by over 12,000 people, 87 percent were against the decision to destroy food. Some respondents, for instance, were of the opinion that the products should be sent as humanitarian aid to Ukraine’s pro-Russia regions of Donetsk and Lugansk. Meanwhile a bona fide reality show was launched before cameras by Russian authorities. To kick-start the event, ten tonnes of cheese were destroyed in Belgorod Oblast. Steamrolled on a field, it was thereafter dumped in a hole. By Saturday, official data said 371 tonnes of various foodstuffs had been managed to destroy. As an example of that, Saturday saw three tonnes of «sanction meat» buried, and 20 tonnes of pepper. However, Mr Putin’s ukase is bumping into the real Russian life. According to TV channel RBK, locals in Smolensk Oblast got busy to carry home the «destroyed» tomatoes, nectarines, and peaches. Referring to a local laboriously collecting what was available on a Krasninsk Region field, the local paper «Rabochii Put» said the sanctioned peaches make for an excellent moonshine with no sugar needed. According to Izvestiya, Rosselhoznadzor only succeeds in apprehending about a fifth of sanctioned stuff as the trucks are driving across borders by country roads in Belarus and Kazakhstan which are beyond their ability to check. When it comes to Moscow’s goal to force Brussels to waive measures imposed on Russia due to its actions against Ukraine, by targeting EU’s sensitive agricultural sector, have not proven too fruitful. European Commission data says EU food export to third countries has increased despite the steps by Russia. Year-on-year growth for August 2014 to May 2015 has been five percent. Europe’s food exports to USA, China, Switzerland, Hong Kong and South-Korea are up.